"Kimmy Steps On A Crack!" “Kimmy Steps On A Crack!” brings back Kimmy’s fellow molewoman Gretchen, one of the more complicated characters on the show. After Kimmy accidentally encouraged her to start her own cult last season, Gretchen did just that. Now she’s living in a compound in the woods with a bunch of teen boys who treat her more like a mom than a kidnapper, threatening to go down in a blaze of glory if the world doesn’t recognize her for the powerful and threatening cult leader she is. 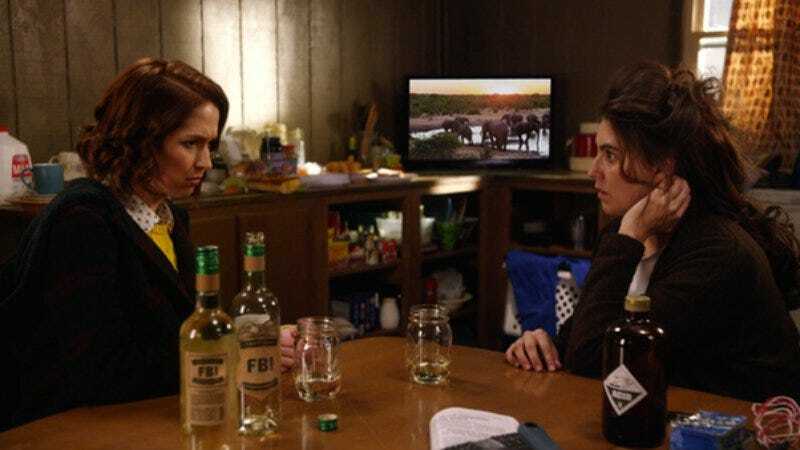 The FBI brings Kimmy in to help diffuse the situation, and Kimmy gradually realizes they aren’t taking Gretchen seriously as a threat…because she’s a woman. It’s not making fun of feminism. On the contrary, Unbreakable Kimmy Schmidt holds a mirror up to the concept of gendered violence, revealing some insightful truths. It may seem silly on the surface that Gretchen is basically arguing that women should be able to be cult leaders just like men, but there are deeper cultural connotations beneath the episode’s absurd premise. Gretchen’s kidnapped boys default to their expected gender roles, acting out, roughhousing, and expecting Gretchen to cook and clean for them, rendering her more of a harried housewife than a cult leader. Compare that to Kimmy and the other molewomen, who all defaulted to their expected gender roles in the bunker, too. They were obedient and subservient to the reverend. Despite the fact that they probably could have taken the reverend out if they had worked together, they didn’t, because he remained in control. In Gretchen’s compound, the power dynamics are flipped. Even the FBI doesn’t take her seriously, dismissing her as an overly emotional woman when she starts crying (after they tear gas her) and sending in a saucy gay friend, an official SWAT team member, to talk her down. Kimmy Schmidt isn’t arguing that women can and should be able to do everything that men can but rather shining a light on the fact that men too easily get away with abusive behaviors and violence. Gretchen as a cult leader seems silly, while the reverend as a cult leader seems…normal. And that normalized perception of male violence is dangerous in and of itself. These themes tie in quite well with Jacqueline’s storyline, making “Kimmy Steps On A Crack!” one of the more cohesive episodes of this season so far. Jacqueline also finds herself defaulting to a caretaker position with Russ’ family, the living embodiment of the patriarchy (also, Russ’ father definitely has a Get Out thing going on given the organs reveal a couple episodes ago, right?). She cooks their special corn pudding for them (leading to a random but hilarious Ghost-like sequence), and she tiptoes around their feelings, needing to stay close with them in order to achieve her goal. Even though Duke can’t quite believe it, Jacqueline’s love for Russ is clearly very real by now. Others continue to box her into a trophy wife narrative, especially given her past as a loud and proud trophy wife, but Unbreakable Kimmy Schmidt consistently declares that people can transcend their pasts. But Duke ends up being a much more serious threat than just someone who expects Jacqueline to take care of him. He also expects her to give in to his advances. I have some hesitations about the Titus and Lillian subplot, but I’m trying to give the show the benefit of the doubt since we don’t yet know where it’s all heading. But right now, it seems like their storyline is bending over backwards to excuse or justify gentrification. Lillian tries to help Titus when he comes down with a case of scurvy, leading both to realize the lack of vegetables and fruits in their neighborhood. Food deserts are a very real problem, but the reintroduction of Big Naturals suggests that large grocery chains are the solution, which is an oversimplification of the issue and also an easy way for gentrifiers to justify gentrification. This show has a tendency to surprise with nuanced explorations of societal problems, so I’m hoping this goes somewhere deeper and reflects a better understanding of what food deserts and urban development and displacement really mean. The most interesting part of the Titus subplot comes at the end when it’s connected to Kimmy’s storyline. Kimmy rushes in to bring Titus home, and she’s shamed for taking so long to get there. Yet again, Kimmy is expected to take care of others. And she says something about it this time: “A male Kimmy would not be treated like this!” Her experience with Gretchen in the woods makes her realize the unfair, gendered expectations still being placed on her outside of the bunker. Gretchen ends up in Litchfield with Black Cindy and someone whose tongue was cut out by the Yakuza, suggesting that Unbreakable Kimmy Schmidt exists in the same universe as Orange Is The New Black and Daredevil, so who’s ready to take this crossover joke several steps too far and map out a Netflix Theory à la the Pixar Theory. Thanks in advance.